Despite the lack of posts, I was still whipping up some new recipes! This one was a favorite of mine – the combination of flavors is delicious and it is super filling. It can either be served warm (heat the quinoa and squash before putting all ingredients together) or as a cold salad. Top with your favorite salad dressing (I used balsamic vinegar and olive oil) and enjoy! 1.) Preheat oven to 400 F. Lay out cubed squash on a greased baking pan or cookie sheet and drizzle with olive oil, salt and pepper, and any other seasonings desired. Bake for about 25-30 minutes, or until squash is soft. 2.) While squash is baking, cook quinoa according to package instructions. 3.) 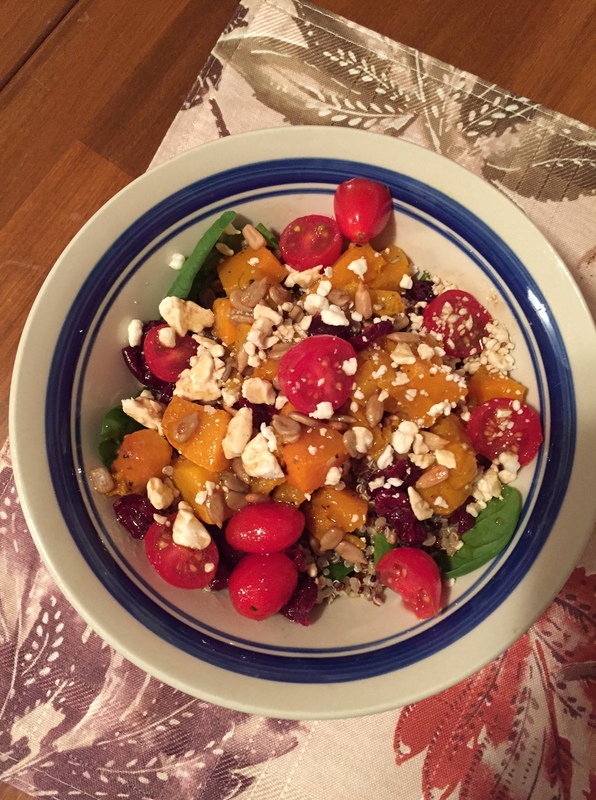 In each bowl layer quinoa, spinach, and squash and top with cranberries, sunflower seeds, tomatoes, and feta. Drizzle with your favorite dressing!